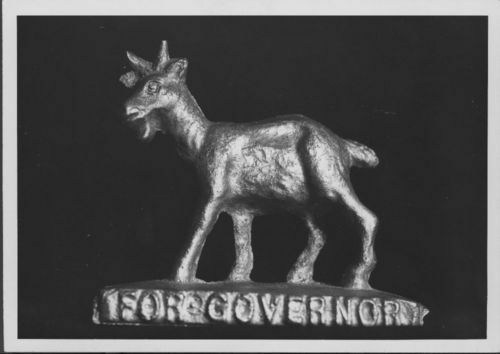 This paperweight, in the shape of a horned goat, was distributed as part of one or more of Dr. John R. Brinkley's unsuccessful campaigns for the office of Kansas governor. Dr. Brinkley, a physician from Milford, Kansas, until his medical license was revoked in 1930, was famous for his advocacy of goat gland transplants. He ran as an independent write-in candidate for governor of Kansas in 1930, 1932, and 1934.